Enjoy the sea, the beaches and its heated pool. Quiet zone. Modern house with perfect location in front of the sea, a few steps from the magnificent beaches of Las Burras, San Agustin and the English and shopping areas, restaurants, medical centers, banks, supermarkets within 10 minutes walk. House on one level, distributed in 3 bedrooms, 3 bathrooms, living room, kitchen. Several terraces, heated pool and solarium with hammocks for 6 people. The kitchen is fully equipped with hob, oven, microwave, blender, electric and Italian coffee maker, toaster, kettle. It has washer and dryer. In addition, TV with foreign channels, DVD, stereo music and internet access (wireless). Pets on request. We can enhance your stay offering you any services that require it. Enjoyed a wonderful stay at this villa last month. Perfect location, right on the promenade so you can walk for miles. Near to a choice of supermarkets and restaurants. The villa itself has been furnished to a very high standard and the kitchen has all the main utensils you need. The owner is very pleasant and helpful. Would highly recommend this property. Thanks so much, your best stay is the most important for us. Lovely villa in a fantastic position overlooking the ocean.Villa was very well equipped although we would possibly have had a barbeque during our stay, had there been one provided. We had a wonderful holiday though. Thanks so much, I will take your suggestion and I hope and wish you could come back to enjoy the house with bbq. We stayed for a week in June. Villa is very nicely furnished. Everything you need is supplied including pool towels. Great location right on the promenade with a lovely beach with watesports nearby. We hired a car from the airport and only took 15/20 mins to get there. We parked outside in the road, but can park inside the gates if the road is full up ( at weekends). Small supermarket a couple of minutes walk, bigger ones 5 mins drive. A few restaurants 15 min walk away, more approx 25 min walk. Pool was great and heated, sunbeds with cushions, parasols and outdoor sofas and chairs. Only problem was air con didn't work in 2 bedrooms and Fernando ( who was extremely helpful all the time) was unable to get it fixed during our stay. (Was due to be fixed after we left) It got very hot which made sleeping difficult. Overall a lovely week. If we go back to Gran Canaria we would definitely stay here again. Absolutely loved and recommend this property. It's in a great location, in between St Agustin and Playa del Ingles and only the promenade separates the house from the beach. Really impressed with the design and layout of the outside and inside areas. There's a supermarket around the corner and plenty of restaurants within walking distance along the front. The host Fernando was great and met us when we arrived with a lovely welcome pack! Thanks so much!!! Very kind and nice family!!! Amazing, I can't wait to go back! This is an incredible property in a fantastic location. The villa is decorated and equipped to a very high standard and everything you could possibly need is close by - beautiful beaches, excellent restaurants and supermarkets to make use of the kitchen. The pool is heated and very private so great to use all day. The owner is very helpful and responsive to messages both before and during the trip. 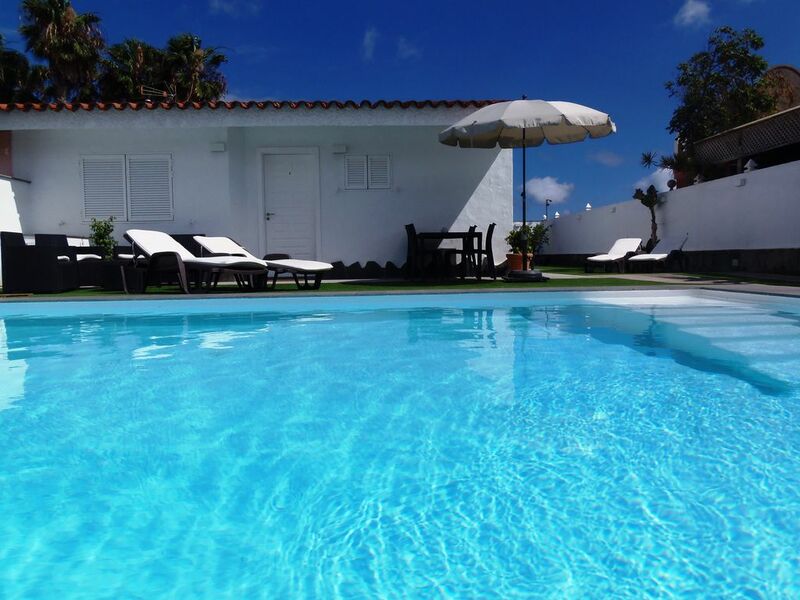 We wouldn't hesitate to recommend this villa to either families or adult groups. The only downside for families is that there is no fence/gate around the pool, this didn't cause us a problem but a fence at the side of the villa to separate the garden from the pool would be a great addition to this villa. Overall we loved our time in this villa and we hope to return next year. Definitely 5*. It`s a good idea to install a pool-fence, I will try it. Gutes sauberes Haus an toller Lage. So angetroffen wie auf den Bildern ersichtlich. Grosszügige, nette und unkomplizierte Betreuung von Fernando. Thanks so much, I try to give an easy holidays for all my guests but pending if you need something. Good luck for all the group!!! It has several beaches with calm waters 2 minutes walk. Furthermore, it has everything you could need for a wonderful vacation around (supermarkets, restaurants, medical center, banks, car rentals, etc.) within 10 minutes walk. No need to rent a car for your stay.